Thank you to everyone for their generosity and support during the publication of 'Season of Gene,' including Timothy Schaffert from the Omaha Literary Festival, Kelly Justice of Fountain Bookstore, George Mason University's Fall for the Book Festival, the Southern Independent Booksellers Alliance (SIBA), The Decatur Library, NYC Sports Trivia, Mo Pitkins' in New York, Patrick Hughes (don't miss Hughes' book, Diary of Indignities), Ryan Walker and everyone in Ragged Glory. Thanks especially to Joe Regal, Brant Rumble, and Lauren Cerand. KIRKUS (starred review): "Crime and baseball make for an irresistible combination in this raunchy, fast-moving caper, a second novel just as good as Hudgens's wild debut (Drive Like Hell, 2005)...A nourishing slice of Americana, expletives and all." BOOKLIST: "Hudgens has scored again. He's given readers an engaging, knowing glimpse of an odd, but no doubt real, world of arrested development. And he knows his baseball." 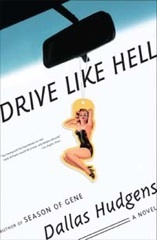 ATLANTA MAGAZINE: "(Hudgens) shows off plenty of the raw talent -- for metaphor, for phrasing, for pure observation -- that gave his first novel, Drive Like Hell, a genuine spark." PUBLISHERS WEEKLY: "Those ready for a rowdy ride won’t be disappointed." 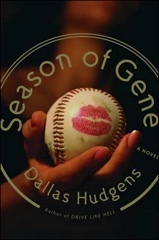 A BOOK SENSE NOTABLE FOR OCTOBER 2007 -- "(Season of Gene) has more action than a Hollywood blockbuster and more heart than a bloodhound. A super book." LOS ANGELES TIMES -- The twang and the heartbreak are real. Hank Williams would be proud, and deeply amused. LIBRARY JOURNAL -- A rollicking tale of love, death, drag racing, drug dealing, alcoholism, country music, and hanging out. ...(Drive Like Hell) will touch a nerve with many readers who have experienced dysfunctional families and survivied to remember. KIRKUS (starred review) -- (Drive Like Hell) is so much fun that it's easy to forget how difficult it is to portray decent people acting like morons with an artfulness sufficient to transform it into boneheaded genius. THE CHARLOTTE OBSERVER -- Hudgens has captured these characters and this milieu with heartbreaking veracity. The writing is splendid.